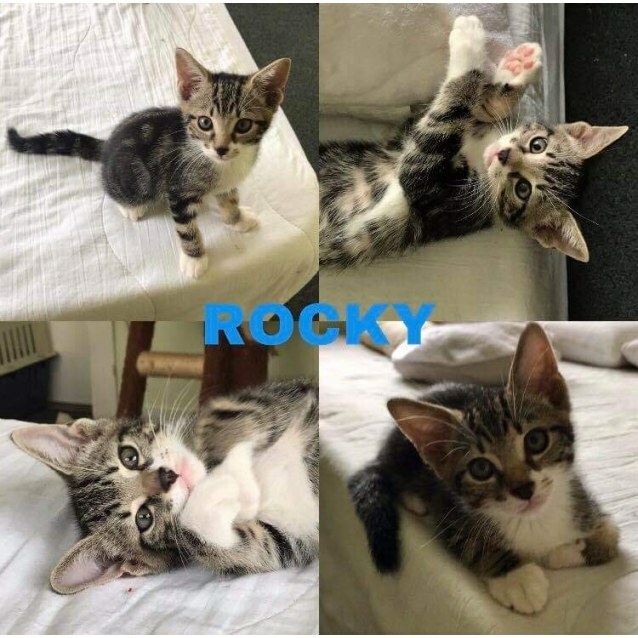 💙 ROCKY is an energetic boy with loads of playing power. He is confident and adventurous, he loves to climb, explore, and to chase toys and his siblings. With his confidence he has no worries meeting new people and other cats. ROCKY is still learning that dogs and young kids are friends, so at the moment he is a bit frightened. ROCKY has a cool striped pattern, four white socks, and gorgeous dark eyes. He likes to cuddle his little sister, and enjoys cuddles and pats from his foster carers. His ideal home would have someone to play with to keep him entertained, and someone to cuddle when he’s ready for a nap.